It is most vital for the online payments world to know and understand chargebacks. 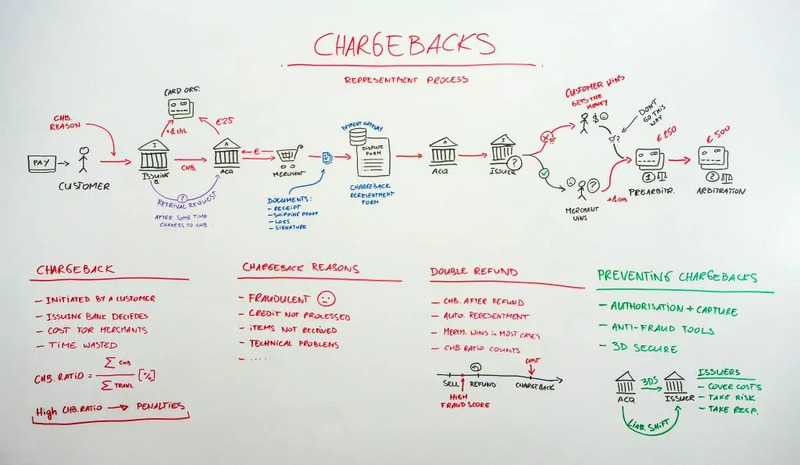 This video blog dives into the world of chargebacks, showing you the process flow, chargeback reasons, double refunds and how to prevent the former. Today, I’m going to be talking about chargebacks and the representment process. So, what’s a chargeback? Well, a chargeback is a form of protection provided by the banks for the customers to be able to file complaints against transactions made on their statements. It’s important to note that chargebacks come with a cost to the merchant, as well as time and energy wasted to dispute them. The higher the chargebacks per transactions for the merchant, the higher the chargeback ratio, meaning more penalties that the merchant has to pay. So, this is what the process looks like. It’s initiated once the product and/or service is paid for and then, the customer decides to go to their issuing bank and file a chargeback. That chargeback is sent to the card organization, as well as the acquirer. There’s a fee, 25 euros, that needs to be paid for, which, at the end of the day, the merchant needs to cover. The merchants then, with the help of the payment gateway — so SecurionPay in this situation — sends relevant documents, receipts shipping proofs, logs, signatures and all this is in a form, the chargeback representment form, which is sent on to the acquirer. Then, it is sent off to the issuer, and the issuer decides who the winner is. If the merchants wins and the customer is not happy, they can decide to file for prearbitration. This results in an additional chargeback for the merchant, as well as 250 euro fee for the loser. If one of the parties is not satisfied, with that decision, they can file for the final stage arbitration. A 500 euro penalty to the loser. Moving back to the beginning: chargeback reasons. What’s important here to remember is fraudulent chargeback reasons. These are extremely difficult for the merchant to win, even if they provide all the relevant documentations and evidence. There’s also credit not processed, items not received, technical problems, faulty cards, and the list goes on and on. Fun fact is retrieval request. Before the issuing bank decides to file a chargeback, they can request additional information about that transaction. SecurionPay has all the relevant forms in order to satisfy the retrieval request. Moving on to double refunds — bad for the merchant, because they have to pay twice. So, here’s an example. Something is sold and a few seconds or a few minutes later, the merchant receives a high fraud score, and they decide they’re gonna refund that transaction. Money is sent back to the customer, but then, the customer still files a chargeback. So, this whole process is started. In most cases, the merchant will win this, but there’s still a chargeback ratio that counts, plus additional costs. How do you fight this? Well, you use SecurionPay’s authorization and capture, of course. Please, check out our authorization and capture video for more information about that (and delayed capture feature). As well as SecurionPay’s amazing anti-fraud tools, which prevent fraudulent activity and, last but not least, our famous non-invasive 3D secure, which shifts the liability from the acquirer to the issuing bank. The issuer then needs to cover the costs, take the risks and the responsibility. So, that’s it for today, when it comes to chargebacks. Thank you so much for watching! Please, leave us some comments and feedback. Bye!